Automakers and consumers alike often look to silly stick-on trim pieces and other goofy aesthetics to adhere to their cars. Some work, some just don’t. Listen guys, I’m all for sport trucks and there is almost nothing that I love more than huge wings (mainly on Subarus), but do we really need to mount those huge wings on the back of our pickup trucks? No. No we don’t. On what might be one of the most beautiful 911s ever built, Porsche designers thought it would be sly to use a plastic, accordion-like cover on each side of the bumpers for the extended USDM bumpers. Why? Fake front mounted intercoolers are just about as useful as that blocked hood scoop your car also has. If your car is naturally aspirated, I will point and laugh if I see you with a fake intercooler. Point and laugh. Before the brand was devoted to the use of the well-known Flying Lady hood ornament, Cadillac decided it would take a stab at mounting a little metal bird to the front of its cars, but because of its stunning resemblance to Packard’s hood ornament, which was a pelican, it was dropped within two years. Could we potentially bring this back? What happened to hood ornaments? I don’t want to give BMW too much flack for this one because from what I understand, the ‘Bimmerang’ is actually an active and useful piece of trim. But I will say it’s silly looking and borderline out of place. For years Ford has been designing their Mustangs with useless side gill-like vent lines. Thankfully, the current generation Mustang wasn’t designed with this, but just you wait. I’m sure in no time there will be a perfect bodykit for you to satisfy all your useless vent needs. Surely there is not one other truck on the road that has more gaudy and goofy looking trim pieces than the 2015 Ram 1500 Laramie Limited. Huge, and I mean HUGE brand lettering on the tailgate and grille, chrome metal thing across the tailgate to emphasize the massive brand lettering, chrome wheels, chrome bumpers, chrome door handles, chrome mirrors, and so on. Can someone please stop them? I assume that electric car manufacturers think that consumers would be completely turned off if a car they were marketing was missing a grill? Or maybe there’s just no other way for them to insert their beloved family face on their cars? Either way, it’s silly. Yes GM, because we all wanted to see the top of the supercharger through your little plexi-glass viewing hole. 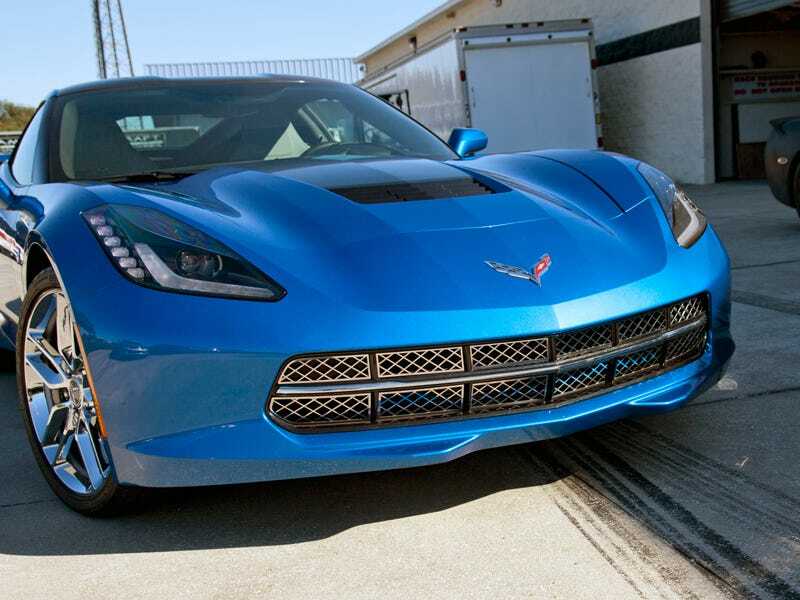 The C7 Stingray that’s pictured above takes it to a whole different level with those awful aftermarket chrome grill brace inserts or whatever you want to call them, but go on and scroll up to the top image. What do you see there? GM’s factory optioned chrome wheels as well as the chrome retainer line in the grill. When will you learn GM? When will you learn?